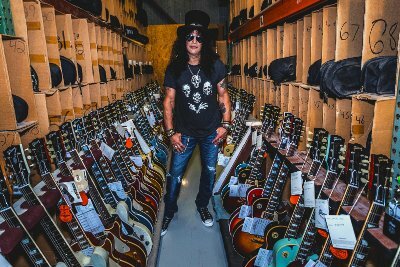 Gibson Brands has announced it has appointed guitar superstar Slash as Global Brand Ambassador, the first such designation in the company's history. As part of the new role with Gibson, Slash is developing new products with three of its celebrated guitar brands, Gibson Custom, Gibson and Epiphone. Details of new products and exclusive content will be announced beginning later this month. Throughout his career, Slash has embodied Gibson's values of quality, prestige and innovation and has brought the indelible sound and style of Gibson guitars to new heights of popularity and recognition over the last 30 years. "We are thrilled to recognize Slash as Gibson's first Global Brand Ambassador," said Henry Juszkiewicz, chairman and CEO of Gibson Brands. "Slash embodies the characteristics of creativity, passion and excellence that are so closely aligned with Gibson and we are very proud of the friendship and mutual success we have shared together for over 30 years. We are also very excited about the future products we will be announcing soon." "It's an honor to be Gibson's first Global Brand Ambassador," said Slash. "I've been working with Gibson since the early days of my professional career and playing Gibson guitars since before that. I'm proud of the creative relationship we've developed over the years." Slash joined Guns N' Roses in 1985 in Los Angeles and quickly rose to international fame by the summer of 1987 with the release of the band's debut LP "Appetite for Destruction," which has sold over 30 million albums and became one of the best-selling rock albums of all time. Slash's signature sound and epic solos were recorded with several of his favorite Gibson guitars, which introduced an entirely new generation to the power and passion of music delivered through those instruments. Over the past three decades, Slash has collaborated closely with Gibson and the company's CEO, Henry Juszkiewicz on several projects including product development, marketing, live events and supporting charitable initiatives with the Gibson Foundation. Slash is currently on the Guns N' Roses "Not in This Lifetime" world tour extending through November, 2017. Details around the new products and exclusive content born from this relationship will follow throughout the year. Visit Gibson.com for regular news updates. Slash has amassed album sales of over 100 million copies, garnered a Grammy Award and seven Grammy nominations and was inducted into the Rock N Roll Hall of Fame. Time magazine named Slash #2, behind Jimi Hendrix, on its "The Ten Best Electric Guitar Players of All-Time" list. Slash helped create signature sounds like the guitar riff on #1 hits for Guns N Roses "Sweet Child o' Mine" and "Welcome to the Jungle." After leaving the band, Slash went on to critical acclaim with Slash's Snakepit and global success with the supergroup Velvet Revolver. Slash's self-titled biography, critically well-received, climbed the bestseller list in both the U.S. and U.K. hitting #8 on the NY Times Bestsellers List. Slash landed on the top of the charts with his first solo album, Slash (2010) which featured Ozzy Osbourne, Fergie and more. Slash and his band, featuring Myles Kennedy and The Conspirators, released the critically acclaimed Apocalyptic Love (2012) which stormed the Billboard Top 200 Albums Chart at #4 as the top rock debut and produced his first-ever #1 rock radio solo hits: "You're A Lie" and "Standing In The Sun." Slash released Nothing Left To Fear (2013) the first-ever motion picture he co-produced from Slasher Films, his film/TV production company. Slash feat. Myles Kennedy and the Conspirators released the album World on Fire in 2014. Live At The Roxy, a live DVD/CD from Slash ft. Myles Kennedy & The Conspirators, was released in 2015.